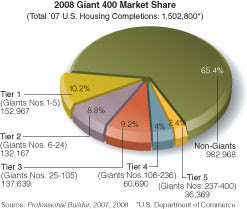 Horton regained the top of the housing industry by strategically retreating, shrinking rather than growing. After becoming the first builder to ever top 50,000 closings (in 2005), and doing it again the next year, D.R. Horton fell to 37,717 closings in fiscal 2007 (-29.4 percent) and $9.6 billion in revenue — 34.1 percent less than the $14.5 billion it banked in 2006. Horton has cut its payroll by 60 percent since the peak of the market in 2005. 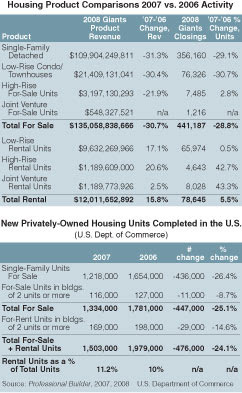 Miami-based Lennar Corp., last year's No. 1, fell farther, dropping 32.9 percent in closings to 33,283, and dropping 36.3 percent in revenues to $9.5 billion — to land a t No. 2. Dallas-based Centex Corp., Bloomfield Hills, Mich.-based Pulte Homes and Los Angeles' KB Home round out the top five, the publicly held group of huge companies we used to call Supernovas. All are now losing ground at an astonishing rate. None of them look particularly super these days.